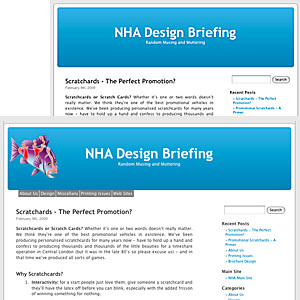 After a couple of hours of fiddling the NHA Design blog is up and running. The WordPress “Famous 5-Minute_Install: (sic) worked a treat although I expect previous experience of wrestling with Joomla installations and creating databases helped. Having run through assorted options and created a few starter categories we’ve got a framework in place but the basic theme is too impersonal. So, as a first step, I’ve added the fish from our main site. Again, previous Joomla experience of templates is a big advantage here because it gave me a clue where to look. Having checked the CSS (not very exciting reading at the best of times) to identify the file used by the default template as a header it’s a case of creating a replacement. After a few minutes tweaking in Illustrator and Photoshop turning a 2-d image into a (sort of) 3-d one, we have a replacement header, complete with fish. Using exactly the same file name as the original and replacing it in the same folder means no other modifications are necessary. Upload it to the server, refresh the page and we’re done. It’ll need some more tweaking later but at least we have a mildly personalised site with similar branding to the main site. This entry was posted in Web Sites and tagged Joomla, Wordpress by Pete. Bookmark the permalink. You make a great point. Got some great information here. I think that if more people thought about it that way, they have a better time understanding the issue. Thanks for this blog. Its fantastic and so is what you’ve got to say.